pre-order before May 1, 2019! Download your free copy of the Bioreactor Bulletin for more product insight! THIS STORAGE/TRANSPORT VESSEL. 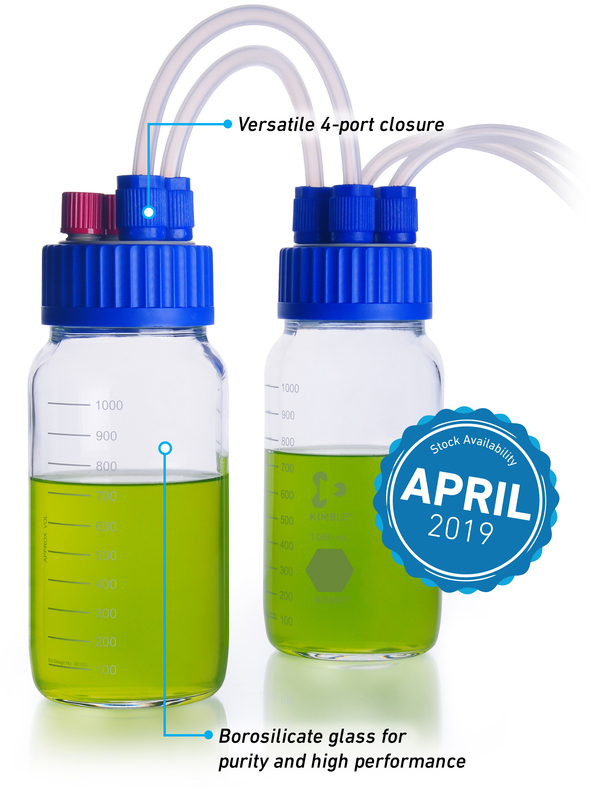 . .
With KIMBLE® GLS 80®, you get the versatility, purity and durablity you need to achieve results for your demanding laboratory storage, bioprocess and production applications. Take advantage of the benefits that only KIMAX® 33 expansion borosilicate glass can deliver. EVOLVES INTO A PHOTOBIOREACTOR. . . Clarity is an inherent property of clear borosilicate glass, KIMBLE® GLS 80® bottles feature > 90% light transmission from 380 to 700nm visible light spectrum, ideal for plant growth. Pre-order KIMBLE® GLS 80® & receive 25% off your purchase! Opt in to receive information about this offer. © 2018 DWK Life Sciences LLC. All Rights Reserved. In exercising this right, you also have the right to request that the personal data concerning you be transferred directly from one data controller to another data controller, insofar as this is technically practicable. The freedoms and rights of other persons must not be affected by this.The right to transferability shall not apply to the processing of personal data necessary for the performance of a task in the public interest or in the exercise of official authority conferred on the data controller. We use Google Analytics on our website with an IP anonymization function. In this case, Google will already reduce your IP address within Member States of the European Union or in other signatory states to the Agreement on the European Economic Area and thereby make it anonymous. Google will use this information to evaluate your use of our site, to compile reports on website activity for us and to provide other services relating to website and Internet use. Google may also transfer this information to third parties if this is required by law or if third parties process this data on behalf of Google. The main function of Twitter is the "Tweet function". If you use this via our website, there will be a link to your Twitter account. Data may be exchanged with other users and data may be transmitted to Twitter. We receive no knowledge of the content of the data sent to Twitter, nor are we informed of its use. Find out more about these questions at http://twitter.com/privacy. There you will find the detailed data protection statement of Twitter. Furthermore, the platform offers you the opportunity to design your own data protection settings at http://twitter.com/account/settings.